For those who have been living under a rock for the past year, 2016 is the centenary of what was possibly the most influential event in modern Irish history. For those who know that there was such a thing as a Rising but are fuzzy on the details, Paul O’Brien’s series of interlocking books, each one focusing on a different area of the fighting – the Four Courts, St Stephen’s Green and Ashbourne – are ideal for catching up on the basic facts. This one centres, as the subtitle would suggest, on the events at the General Post Office (GPO) and little else. The wider issues such as the choice of strategy by the Rising leaders (their failure to secure sites like Dame Street allowed the British to isolate the GPO), the confusion over orders that meant that the majority of the country stayed quiet, and the subterfuge within the Irish Republican Brotherhood that made the Rising as much of a conspiracy within a conspiracy as anything (to use Professor FX Martin’s phrase) are touched upon, then dropped. Likewise, the personalities and motivations of the Rising leaders, as contrasting as, say, Patrick Pearse’s and James Connolly’s, are unexplored. This is a narrative work first and foremost. Given the limited length of the book (141 pages, index included), it was probably a mistake on O’Brien’s part to quote The Proclamation of the Irish Republic in full. It is well-known text and it feels like filler in a work that is otherwise tightly focused. 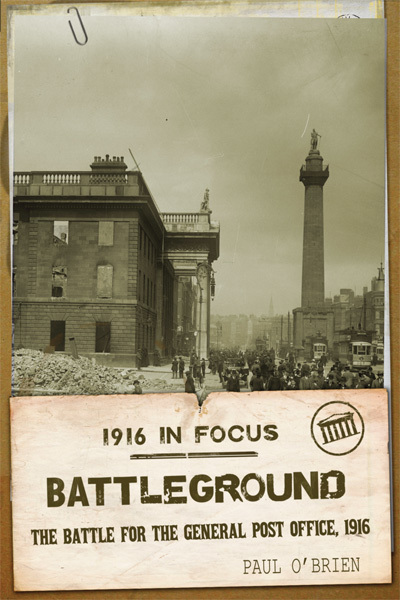 The book begins with the minimal of preamble – a brief foreword on the state of Dublin at the time and the political build-up to the Rising – before cutting straight to the Monday morning of 24th April when the different participants assembled and the first of the Volunteers entered the GPO. A salvo of shots to the air was enough to clear out the majority of dumbstruck civilians before the Volunteers set to work to turn a post office into an improvised fortress. A postal worker had time to telephone the superintendent on duty in the Central Telegraph Office in London with a message that ended with: The streets are not safe. The truth of that warning would become apparent when the authorities moved their soldiers into place to quell the rebellion. After the initial British advance through the northern suburbs of the city was checked along the railway line of the North Wall Station, the GPO garrison knew that an all-out enemy assault was only a matter of time and hunkered down to wait. The hourglass was quickly running out, as O’Brien puts it with a flair for the dramatic (as indicated by the titles in the rest of the series – Crossfire, Field of Fire and Shootout). But first, there were other issues to take care of. Later on the first day, Pearse read out the Proclamation in front of the GPO to a mostly indifferent crowd. Many of those gathered were women with husbands serving abroad in the British Army, the ‘separation women’, who were the most vehement towards the Volunteers on duty outside the GPO. A group of priests who tried clearing people out of then-Sackville Street and harm’s way were only partially successful. Looting broke out, with the sweet and toy shops being the first to be targeted (presumably it would be ‘Foot Locker’ today). As a result of the speed of the uprising, a cavalry unit of Lancers entered the scene on Sackville Street, still ignorant of the scale of the trouble and believing they were there to disperse a mere civil disturbance. A volley of shots disabused them of that notion. The immediate result of the Rising was not so much revolution as confusion. Despite the unsightly scenes outside, morale within the GPO garrison remained high as night fell. The failure to first secure Trinity College, however, meant it became a firing post forenemy snipers. 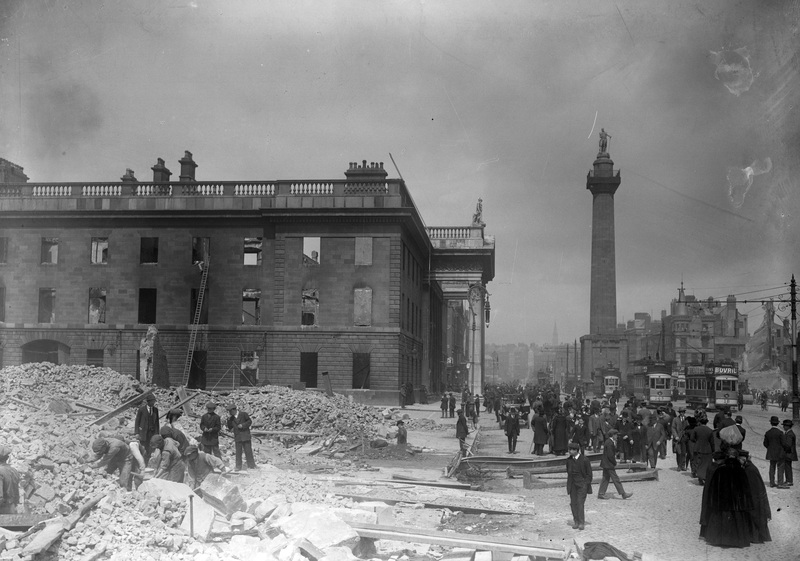 Looting continued in the streets even as the Rising leaders in the GPO learned that the plans for a nationwide rebellion had failed, leaving Dublin to resist alone. And resist it did, even as the gunboat HMS Helga sailed up the Liffeyonthe Wednesday to shell the city centre and British platoons continued to advance in the teeth of heavy fire. O’Brien takes full advantage of the wealth of first-hand accounts now available Witness Statements from the Bureau of Military History, allowing readers an intimate, close-up view of the action. By the Friday, the pressure was enough for the Volunteers to abandon the GPO and take doubtful refuge in buildings around Moore Street, the same site under danger from Celtic Tiger developers until purchased by the State in April 2015. That there were plans for a breakout attack on British barricades before the decision was taken to surrender indicates that the esprit de corps among the Volunteers remained strong. The Rising leaders were, of course, executed, by which point the reader is probably thoroughly exhausted from all the previous shootings and shelling.The photographs included show the damage inflicted on Dublin, which resembled Sarajevo or Beirut by the end, but the most striking one was taken during the fighting at night with the city in flames. I remember seeing Joe Plunkett with plans in his hand outside Liberty Hall. He was beautifully dressed, having high tan leather boots, spurs, pince-nez and looked like any British brass hat staff officer. [James] Connolly looked drab beside him in a bottle green thin serge uniform. The form of dress of the two men impressed me as representing two different ideas of freedom. Two different ideas of freedom, indeed. What these freedoms precisely were and to the extent either were delivered, the reader will have to go to a more in-depth work. But here is a good start.